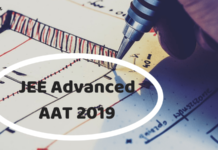 JEE Advanced 2019 Registration – IIT Roorkee has started the registration for JEE Advanced 2019 from April 22, 2019, for the foreign nationals. The last date to apply for JEE Advanced 2019 for all the candidates is May 09, 2019. The Indian candidates who are among the top 2 lakh students in the JEE Main AIR are eligible for JEE Advanced Registration, which starts from May 03, 2019. To fill the Joint Entrance Examination (JEE) Advanced 2019 Application Form the candidates have to register, fill the application form and pay the application fee to complete the process. For more details read below. 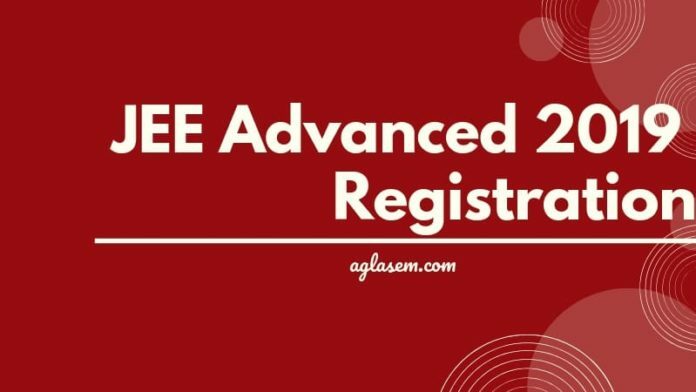 Latest: JEE Advanced 2019 Registration starts fro the foreign national candidates. Apply from the direct link below. Apply online: Click Here to apply for JEE Advanced 2019 (foreign nationals only). Before starting with the online registration process of JEE Advanced 2019, the candidates need to be ready with some important documents. The candidates need to upload the scanned copies of these documents in the application after registration. Thus make sure you keep the scanned images of the following documents handy. Either class 10 certificate or the birth certificate as a proof of date of birth. A gazette notification of name change if applicable. If the category is OBS-NCL, then an OBC-NCL certificate in confirmation with the latest guidelines of the Government of India. If the category is SC/ST, then an SC/ST certificate in confirmation with the latest guidelines of the Government of India. PWD certificate issued by the notified medical authority. Step 1: Visit the direct link above. Step 2: In doing so a page with instruction opens, as shown below, click on the “Proceed to register online” button. Step 3: After that, the candidate has to complete the registration. 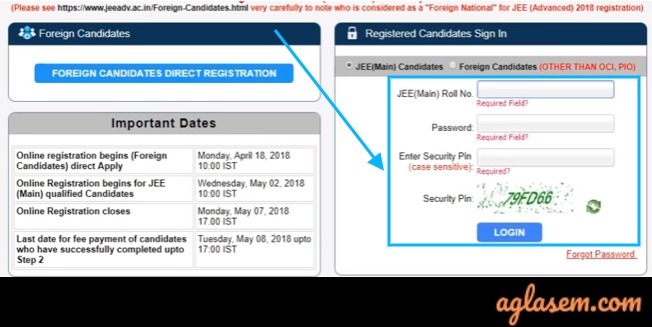 To do so the candidates have to log in using their JEE Main 2019 roll number and password. 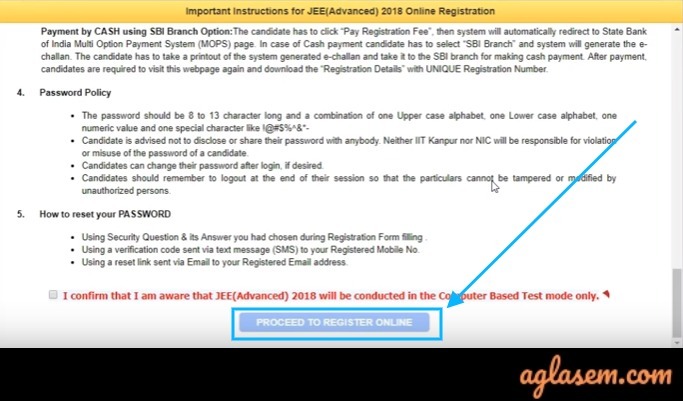 Step 4: After logging in all the details that were provided at the time of filling the JEE Main 2019 application form is displayed on the screen. The candidates need to add an additional phone number and email id to complete the registration. Also, they need to fill in 5 choices of the examination city to appear in the exam. Step 5: Upload the necessary documents. The format of the documents must be in JPG and the sizes must range between 50-300 KB. Step 6: In the last step pay the registration fee as applicable in the online mode or suing the e-challan facility. After the completion of the entire registration process, the candidates can check the status of the application form submission under their login. To check the status the candidates need to log in using their application number and password. Thereafter on the dashboard, the status is flashed. The status is usually reflected 72 hours after the payment of the application fee. Candidates should be among the top (including all categories) by scoring positive marks in Paper‐1 of JEE (Main) 2019. A candidate should have been born on or after October 1, 1994. Five years relaxation will be given to SC, ST and PwD candidates. Candidate should have appeared for the Class XII (or equivalent) examination. A candidate should NOT have been admitted in an IIT irrespective of whether or not he/she continued in the program OR whose admission at IITs were cancelled are also NOT eligible to appear for JEE (Advanced) 2019. Q1: What is the eligibility criteria for JEE Advanced 2019? A: If you qualify the cutoff of JEE Main 2019 to appear in the JEE Advanced 2019 exam you can apply for the exam. However, you need to fulfil other criteria like age limit, year of qualifying class 12 exam, JEE Main attempts etc. Q2: How can one pay the exam fee? A: In online mode using net banking or debit/credit card or suing e-challan facility. Q3: What documents will one need to upload during the online application process of JEE Advanced exam? A: You can check the list fo documents available on this page above. It is mandatory to upload them in the correct format, or else the form will not be accepted. Q4: How can I confirm my registration status for the exam? A: The registration status of the exam is made available under your login within 72 hours of payment of fees. The JEE Advanced 2019 Admit Card is only issued to those candidates who register for the exam successfully before the last date. The application fee must be submitted to complete the application process. The admit card contains the exam centre address, date and time. There are important instructions in the admit card that are to be followed on the exam day. Make sure you carry the admit card with a valid photo ID proof. The soft copy of the admit card is not acceptable at the centre, thus carry 2-3 print copies. Candidates have to download the admit card from the official website under their login. 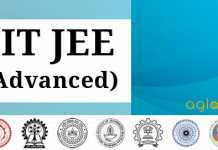 Joint Entrance Examination Advanced known as JEE Advanced is conducted after the commencement of JEE Main. Candidates who score well in JEE Main an take the JEE Advanced in order to take admission in IITs. The courses a candidate can choose from are B.Tech, Bachelor of Science (BS), B.Arch, Dual Degree B.Tech.- M.Tech, Dual Degree B.S.-M.S, Integrated M.Tech and Integrated M.Sc. The admission in the IITs is based entirely on JEE Advanced AIR. The AIR is prepared based on the scores of the candidates in the exam. There is no other mode to take admission in the IITs, except for clearing the JEE Advanced exam.